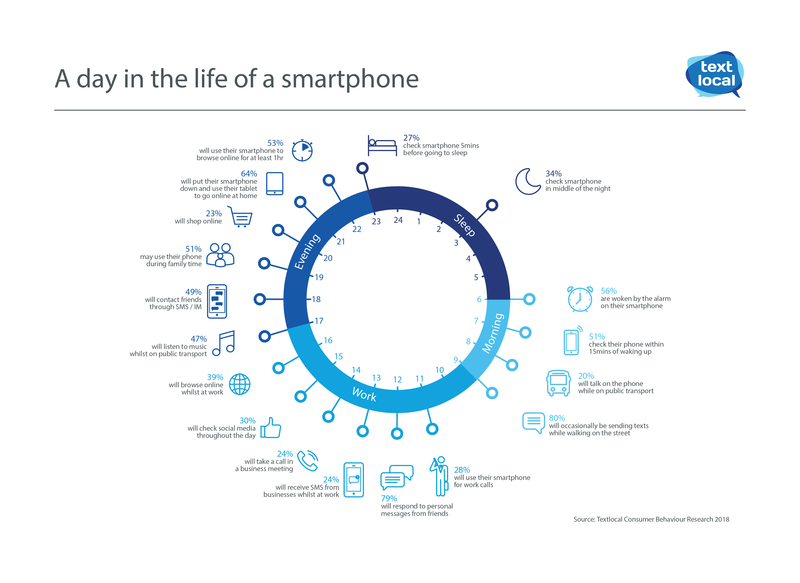 With 34% of smartphone users checking their mobile phones in the middle of the night, we explore how consumers are using their mobile phones to ask the question; are we addicted to our smartphones? It’s been a long time since mobile phones were used just to make phone calls on the go. We’re now using them wherever we are, whatever we’re doing. 56% of mobile users are woken up by their phone alarm in the morning. Before even leaving their bed, 51% of users will check their phone for messages. Phone calls and text messages are still the most common activities across smartphones, with 92.2% of users stating that sending text messages is the most activity undertaken on their phone. In fact, the Mobile Consumer Behaviour Report has discovered that 80% of people find it acceptable to send an SMS while walking along the street. Mobile usage doesn’t stop during working hours either. Interestingly, 79% of mobile users will respond to a personal message during the working day. We were also surprised to find that 24% of consumers will take a call during a business meeting. Our research showed that the UK as whole are using their mobile phones for 16 hours or more a day. Consumers will also use their mobile phones, during work time, family meals and even 34% of smartphone users will check their device during the middle of the night. With 31% of consumers admitting they’re addicted to their smartphones, almost everything we need to support our daily life is now contained within one device. So how can businesses take advantage of these behaviours? Sending SMS alerts, offers and tickets adds to the customer experience and has a positive effect on how your customers view your business. Download the Mobile Consumer Behaviour Report and discover how mobile phones have become the digital swiss army knife we carry today.